Ranked as the richest language in the world, Greek is the only ancient language that remains alive today. It is understandable then, as to why some Greek words are said to be untranslatable; Meraki (may-rah-kee) is one of those words. The modern Greek use it to describe doing something with the utmost passion, infinite devotion, and undivided attention. 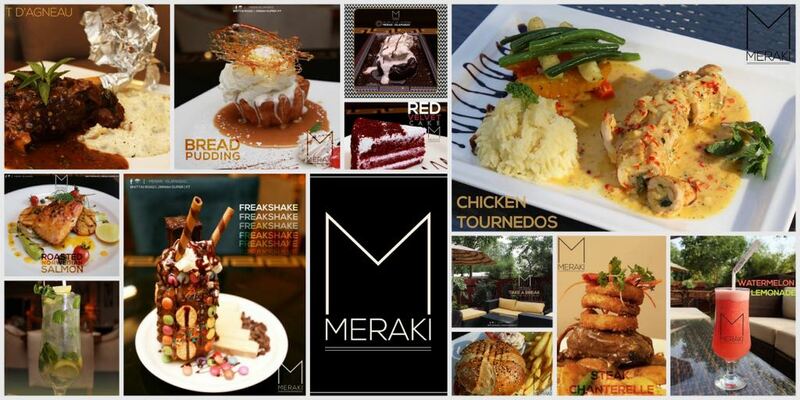 To put your soul into something, to put a little bit of yourself into anything you do – that is true Meraki. 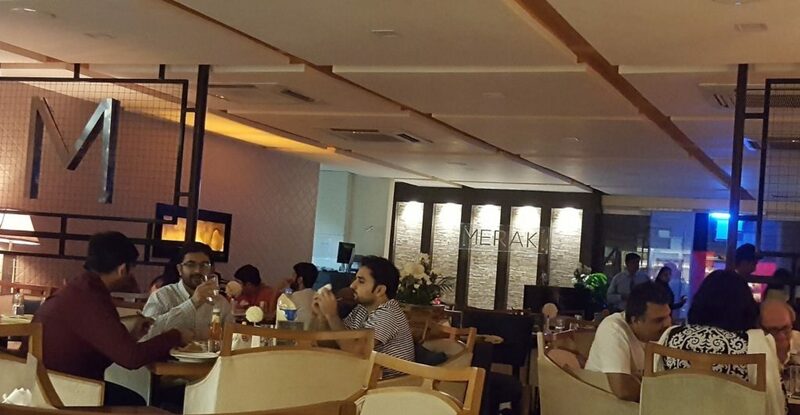 And I have to say, the staff at this upscale, new restaurant in F7 Islamabad, is set out to do exactly that. Walking in, the restaurant is dimly lit with my favourite kind of yellow light that casts an instant soothing affect on the nerves, in much contrast to the blazing sun outside. Also available, is outdoor seating arrangement for when the weather is pleasant. We were seated almost immediately, and I could not have been more impressed with the quality of service. 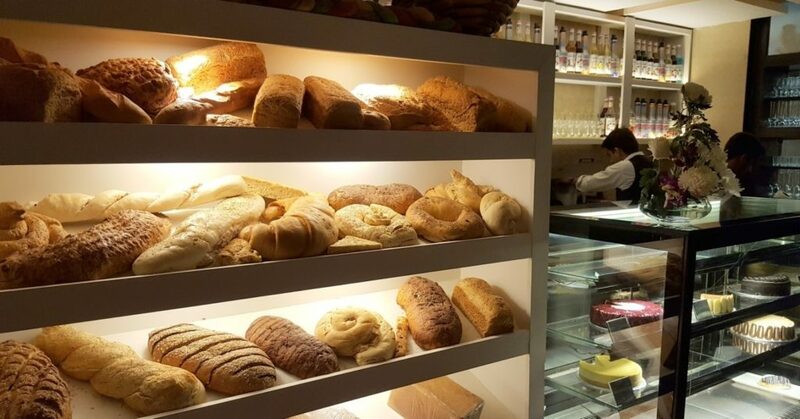 The menu offers a large variety of gastronomic delights to choose from. Appetizers like the Tomato Caprese, Grilled Calamari and Buffalo Chicken Wings are just some of the highlights. Options for soups and salads are exquisite, and the main course menu offers versatile entrees from all over the world. The items on the menu are a bit pricey, but definitely worth every penny you pay. The portions are adequate, although some people may find them on the small side. Every single plate that was presented was a miniature work of edible art; from the appetizers to the drinks, the main course, and the dessert – the attention to detail was impeccable. It is a struggle finding places these days that cater to their guests the way the staff at Meraki did. They were polite and very attentive. 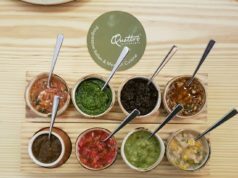 The manager was particularly helpful in recommending items from the menu, the speed of the service was perfect and everything arrived at comfortable intervals. One thing I loved about the restaurant was the “welcome drink”. This arrives in a little glass and is, quite possibly, the best thing to sip on while you wait for your order to arrive. 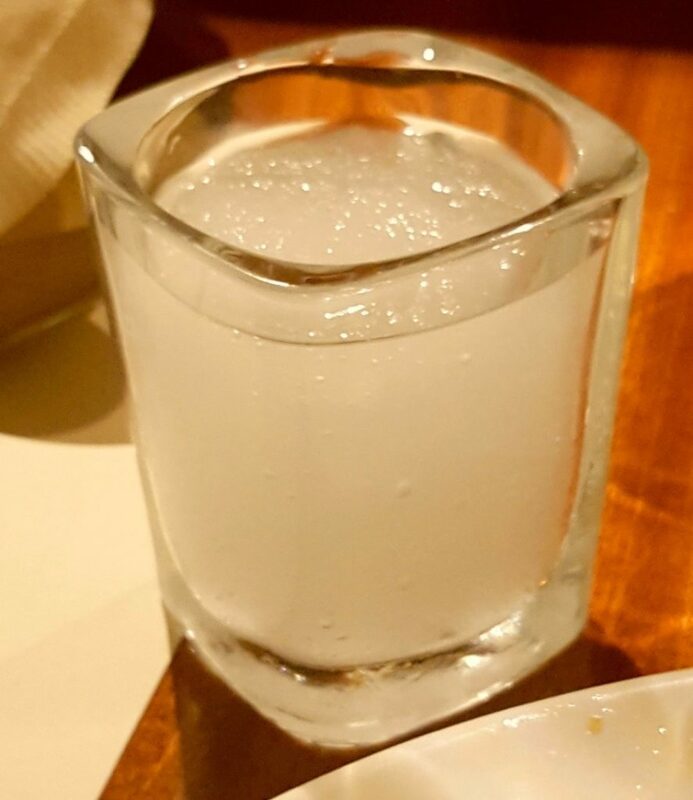 The lemonade shot is a perfect blend of lemon, sugar, salt and ice – and so refreshing. 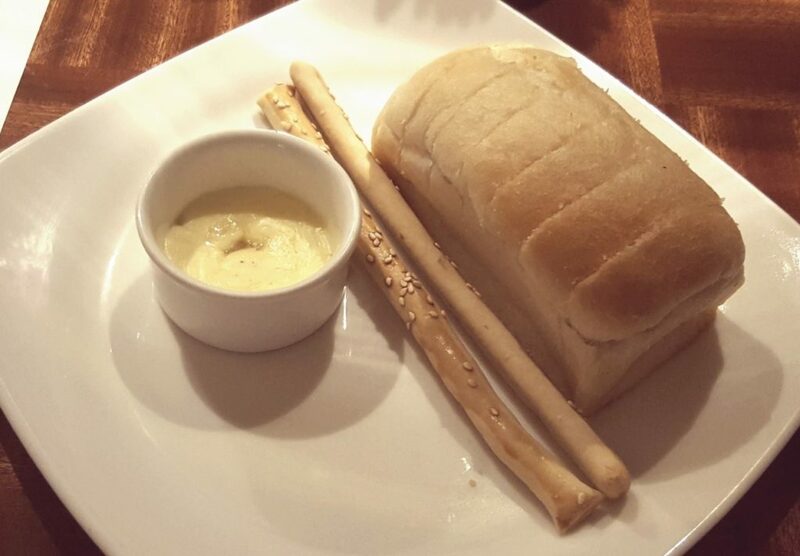 Next came the complementary bread and sticks; soft, moist, fresh and baked to perfection, with a side of the butteriest butter I have ever tasted. Butter and bread barely down, the Tomato Caprese arrived next – Juicy red tomatoes on a bed of basil and Mesclun salad, with slices of mozzarella cheese and balsamic dressing. It was love at first bite. 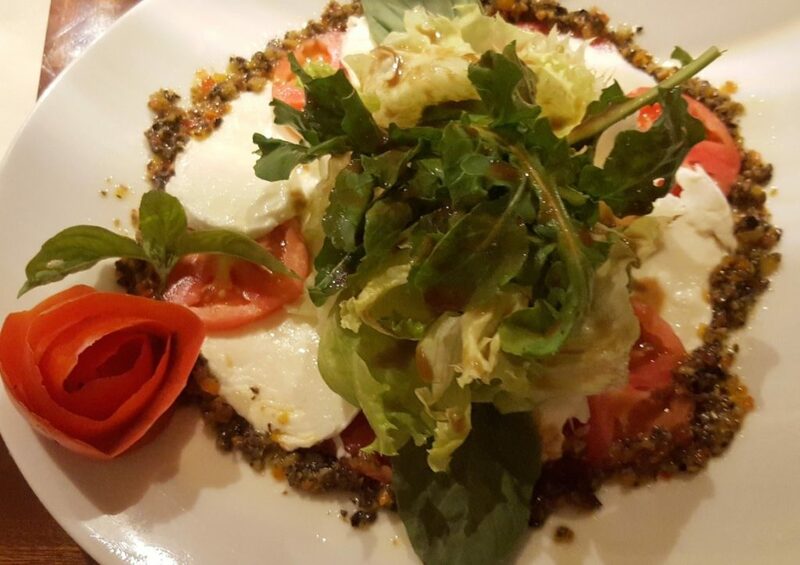 Light, flavorful and so very fresh – it was the perfect start to our decadent meal. 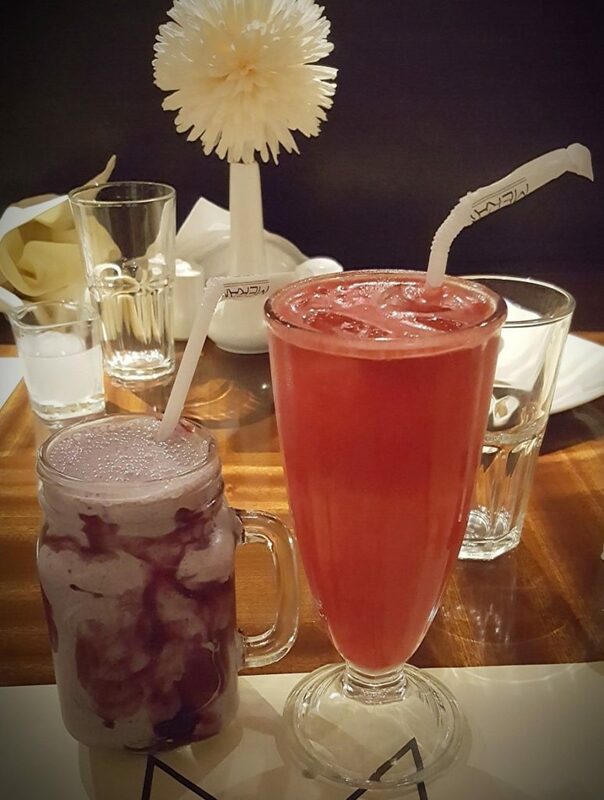 Our drinks arrived shortly after the appetizer; freshly blended watermelon juice with just a hint of mint and lemon and blueberry banana smoothie that came in a mason jar. The main course revolved around two dishes; Steak Chanterelle and Moroccan Chicken. Both exceeded my expectations of taste level. There is nothing worse in life than ordering a steak at a restaurant and seeing a very suspicious looking slab of meat arrive after you have waited for over thirty minutes. Luckily for us, the wait was under thirty minutes and the steak, when it arrived, was excellent. We had ordered it medium, and it was presented in all its golden brown glory. Juicy and soft enough to be sliced easily without having to go to war with the steak knife, it was a clear winner. The buttery Chanterelle mushrooms twinned beautifully with the rich sauce, taking the flavor to the next level. Creamy potato dauphinoise served as the perfect side dish. 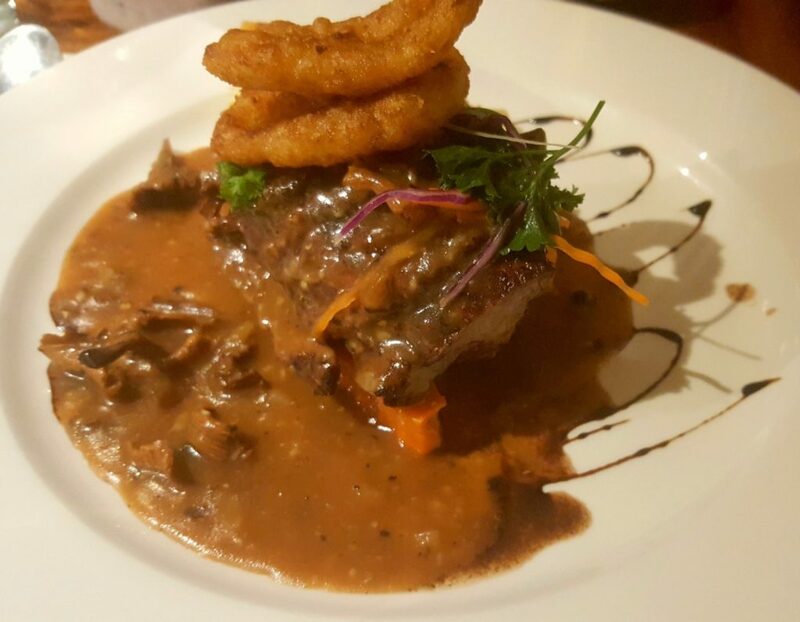 Sending a steak back to the kitchen would definitely have killed the chances of a happy ending – but not in this case. Tender, succulent and full of exotic flavor, this dish did not pale in comparison to the steak I had sampled. Instead, it more than held its own. 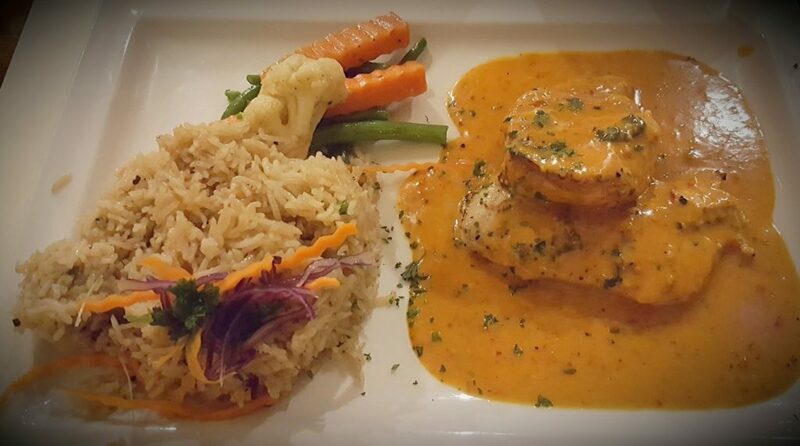 A bit on the spicy side, this char grilled marinated chicken was served with a side of brown rice and sautéed vegetables. For me, the creamy sauce was what tied everything together. Quite unapologetically, I drowned my chicken and smothered the entire contents of my plate with it. Recommended by the manager of the restaurant, it definitely lived up to my expectations. The final round was up. For me, the dessert is always the defining moment of every meal. We decided to end our meal with the Belgian Chocolate Lava Cake. Having tried different versions of this particular dessert at other restaurants, I was keen to explore if the chef would do something different with it. That part didn’t come forward – however, the dessert on its own was quite good. Once again, the presentation was on point. The molten chocolate pool in the bottom of the pan complemented the cake, creating a dessert so intensely rich and gooey. 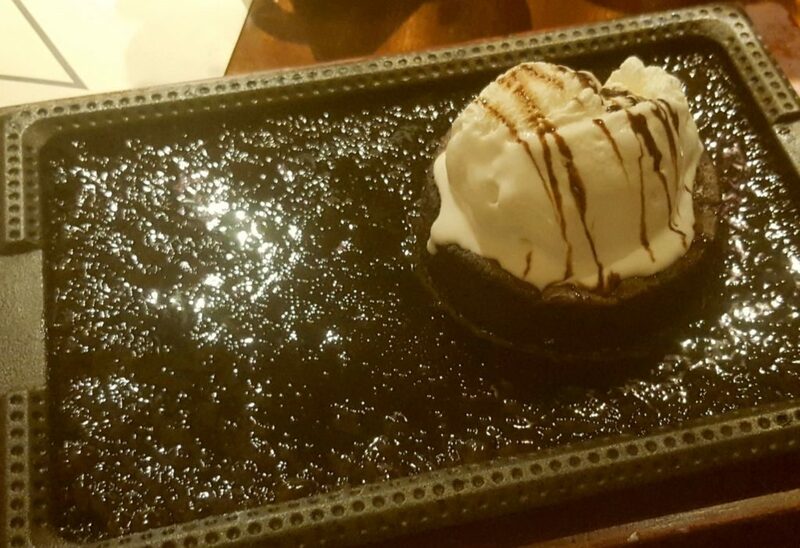 The cast iron skillet holds heat, and the lava cake was warm till the very last bite. Served with a scoop of vanilla ice cream, it made a memorable end to our dinner. The overall experience was absolutely delightful. Highly recommended, especially for formal meetings, this restaurant will have you lusting after every dish leaving the kitchen and salivating at the memories! Find them now at Bhittai Road, F7 Jinnah Super Islamabad.